Comfortable homes – We regularly have an excellent selection of pre-owned two- and three-bedroom homes, each one featuring a handsome, low-maintenance exterior and cozy interior. Resort-style amenities – Like all the best 55+ communities in Florida, Hyde Park is designed to facilitate the active retirement lifestyle. To that end, we proudly offer a variety of resort-style amenities that are for the exclusive enjoyment of our residents and their guests. Our clubhouse, which is a hub of social interaction, features an outdoor pool and spa, banquet hall, Bingo hall, fitness center, library, shuffleboard courts, garden sitting area, and more. 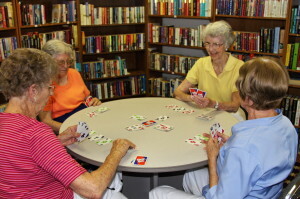 Thanks to our clubhouse and fun-loving residents, there is just about always something invigorating going on, whether it’s cards, Bingo, or group aerobics. Area perks – Whereas some 55+ communities in Florida can feel a bit isolated, that isn’t the case with Hyde Park. We are located at 14253 W. Colonial Dr. in Winter Garden, just a short drive away from all the excitement of Orlando. Residents of Hyde Park enjoy convenient access to world-class theme parks, an international airport, museums, shopping facilities, golf courses, and restaurants of just about every conceivable kind. Frequently, our 55+ community residents drive their golf carts to Lake Apopka and historic downtown Winter Garden via a recently completed golf cart path. We invite you to contact us today and schedule a visit so that you are able see firsthand why Hyde Park is justifiably called one the top 55+ communities in the Orlando, FL, area.